And within that brief story we find a mystery. There is no explanation of the dividing of the Earth, or why Peleg’s name should be uniquely associated with it. If Peleg and Joktan were brothers, why wasn’t the Earth divided in their days? This vexing little question has rippled through my mind ever since I once did an extensive study of the Book of Genesis. Obviously the same question has crossed the minds of a few theologians and even an occasional geologist. 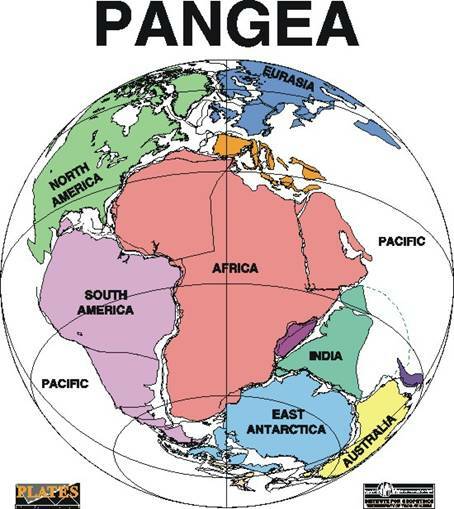 There is a theory, based mostly upon new and intricate maps of the ocean bottoms and shapes of the land, that the continents have been split apart, possibly more than once. For example, if you could push Europe and Africa flush against North and South America, they would almost fit perfectly together like parts of a jigsaw. We tend to agree with Morris on this. Had such an event occurred so soon after the catastrophic events that brought Noah and his followers back to dry land, we should have yet a second myth (memory) of escape similar to the flood story. It also begs the question: If Noah had help from outside forces that perhaps moved a remnant of humanity through time, why would they be dropped on the planet at a time preceding a second catastrophic event of that magnitude? Yet the author of this story within the Book of Genesis clearly chooses to separate Peleg from the rest of the names in the genealogy of the family of Noah by saying that in his days was the earth divided. Clearly something significant was going on in the known world during Peleg’s time. A careful study of Chapter 10 gives us an important clue. The genealogy breaks down into families of the three sons of Noah. Each family moved off into various parts of the known world and established small tribal kingdoms that later grew to be countries with apparent borders. Even if they were not yet able to make paper and publish maps of the territory, the people of that day may have been very capable of establishing territorial jurisdictions. It seems to be human nature to do stuff like this and even go to war over border disputes. After only five generations, when Peleg lived, it seems that the human race forgot its genetic and family links and was already drawing lines in the sand, marking territorial differences. The racial, religious and political bigotries were already being established. “The traditional interpretation relates Peleg’s day to the division of language/family groups at the Tower of Babel. Comparing the lineage of Shem, which includes Peleg, to the lineage of Ham, which includes Nimrod, leader of the rebellion at Babel, we find it likely that Peleg was born soon after the dispersion (assuming the genealogies are complete).